zhann2 is using Smore newsletters to spread the word online. -predators is human, snow leopards and weasels martens. Location: Eastern Himalayas and Southwestern China. Climate: The climate is sunny and windy, it only can live in a temperature between 17 and 25c. Home: They made its shelter and homes out of hallow trees. Special body covering: It is covered with fur and the color is reddish on the top and blackish on the bottom. Size,height,length,weight: Head and body length is 56 to 63cm and their tail is 37 to 47cm. Male weight 4.5 to 6.2kg,female weight 3 to 4.5kg. Communication: They communicate using body language, such as head bobbing and tail arching and a variety of noises (such as a threatening “huff-quack” and a warning whistle). Unusual characteristic: Red pandas have a slow rate of reproduction and have a great deal of difficulty recovering from population declines. The baby red panda grow relatively slow that the develop extended associations with their mother that last for over a years. And they behave much like a larger carnivores. Also hunted where the forest has bamboo. Human hunt them for making clothes and other predators such as snow leopard s hunt them for food. Most people in the world knows that hunting red panda is illegal but they still do it for clothes. 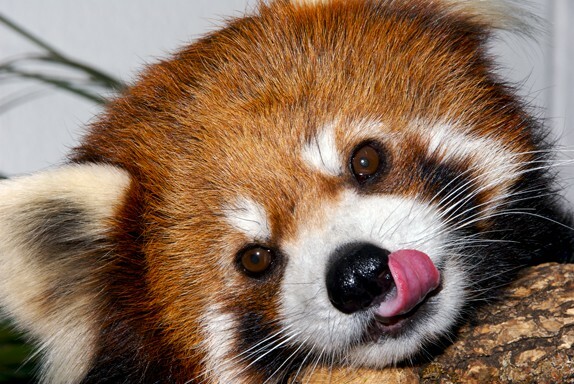 Each year the population of the red panda decreased because of the human destruction and the hunting. And it is very important for saving red panda so there will still left some in the world.